I finally bought it. . .
Harry Potter and the Half-Blood Prince -- yep, you heard right. And I like it! In fact, I'm over 100 pages into the book and can't wait to pick it up again tonight. Now I'm off to play memory with Maddie. No knitting or spinning to report today. Why make a swatch. . .
A fun little project that only took me about an hour (even with bits of tinking due to design mis-calculations). Now I only had enough yarn to make one, so I suppose this little mitt won't get much wear, but at least now I know how much fiber I need to make a pair! *** Note appalling lack of light tent usage for these photos. I still don't have a permanent set up, but I'm working on constructing one! Thank you so much Valerie for a link to this article on light tents. It worked! And the "tent" I used for this shot was just a pillowcase and a couple of lights. Much better! And after I construct a better tent, my pictures will hopefully continue to improve. Thank you so much, Valerie! 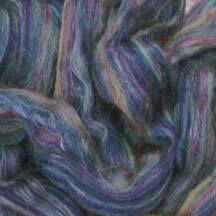 The flash gave me too much shine -- BFL is kind of shiny I guess. But I think that between the two photographs, you can get the general idea of what it looks like. In answer to some questions about navajo plying, I direct you to my favorite spinning website once again -- The Joy of Handspinning has a great little video free online. How cool is that? I've talked about this book before, but I really need to mention it again. It proved itself as a great resource and that's the difference between a good book and a great one in my opinion. 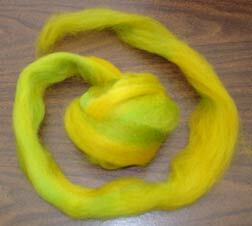 So if you are interested in dyeing, I would certainly recommend Deb Menz's Color in Spinning . Now I'm off to prepare some more pattern orders for shipment! The Carroll Bag is on it's way to lots of yarns shops and will hit the online store some time in the next week! So not what I was expecting! To tell you the truth, this was my least favorite colorway when it came out of the pot. It was striped and very shocking with the saturated greens and yellows. 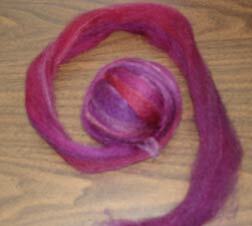 After pre-drafting things really softened up and after the plying -- well, it's a whole different thing! 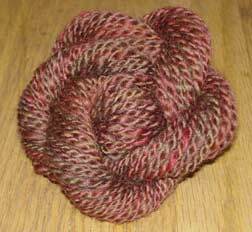 Even with navajo-plying to preserve the colors, there is so much blending that it's almost a heathery solid. 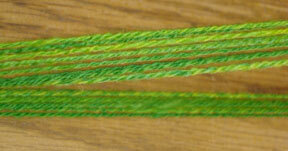 The other half of this colorway will be 2 plied for comparison. Although that might wait while I spin up #5, which has jumped ahead in the standings after all the lovely comments today! Here are my color samples all hanging out together. While I had a lot of fun the last time Theresa and I got together for dyeing, I think this time was much more successful. And let me tell you, that wasn't an accident. 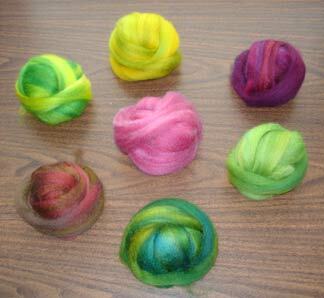 Good dyeing means a lot of prep work! More than half the day was spent getting the right tools and getting the dye stocks properly prepared. But the results were worth the effort, don't you agree? Colorway 1 . . .
Colorway 2 . . .
Colorway 3 . . .
Colorway 4 . . .
Colorway 5 . . .
Colorway 6 . . .
Colorway 7 . . .
Hopefully I will start spinning these up tonight. Do you have a favorite? Is there one you would like to see me spin first? Leave me a comment and let me know. Then go over and take a look at Theresa's. I think my favorite colorway of the day was her intense red/orange/brown! No time to post now, but Theresa has many more pictures. Go take a look! 57!!!!!!!!! And believe it or not, 5 people guessed the correct number. They were: Chelle, Tanya, Brynne, Lizzie and Sarah. I had Maddie draw a name and Sarah is the winner! Send me your snail mail, Sarah, and I'll get a package off to you this week! And thanks to everyone who left me nice messages, wishing me a happy blogiversary. I really can't believe it's been three years! Knitting content tomorrow -- it was a long car ride to Ohio, so I actually did get some knitting done! Ireland: A Novel by Frank Delaney. (Ireland was on my 2005 Reading List.) This is a great book -- I can't say that enough. Every night when I open it up I turn to Pete and tell him how much I like the book! Delaney takes a novel approach, using a stories-within-a-story framework. Each story tells a bit of Irish history, but not straight, boring history. No, these stories are told in the fashion of a traditional Irish wandering storyteller's tales. So interesting and so fun! I would *highly* recommend this book. And in non-fiction. . .
What's next? Well, I really want to get this book. . .
Yep, Harry Potter and the Half-Blood Prince . I've read and enjoyed all the others (guilty pleasure!) but I've always waited until they were available at the library -- which may take months with this book! So I'm really getting weak. I must get this book. Argh! Contest winner revealed on Monday. . .
Wow! I can hardly believe it's been three years. It's been a lot of fun, and I've learned so many new things from other bloggers. The online knitting community is incredible and I'm so glad that I am part of it. In honor of my blogiversary, I am going to hold a contest. Guess how many knitting books** I have -- closest one wins. If there is a tie, I will draw a name. The prize will be knitting themed. Leave your guess in the comments! The winner will be announced on Monday as I will be busy attending a funeral this weekend. ** Knitting book will be defined as a book specifically about knitting. It will not include magazines, patterns booklets that are ISBN-less, or books about knitting related crafts such as spinning or dyeing. Back-tack, or back tack II to be more precise. The original back-tack was so cool and I have to admitI was jealous when I saw all the cool goings on. You can see the goodness at the Flickr album for back-tack. Once again, I'm the bearer of bad news. Subscriptions are closed for this month, but there's always next month! Do you know about any cool things on the web? Leave me a comment! I have had no time for anything lately. As a result, I haven't really added any blogs to my Bloglines in a while. I know that there are a lot of great sites out there that I don't know about. So if there is a craft blog that you are crushing on right now, leave me a link in the comments! And a group shot of out finished crafts. That's Pete's up in the corner. 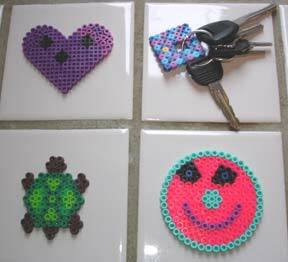 Maddie made the face and the heart and the turtle is mine. 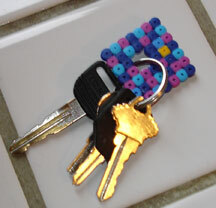 And for those of you unfamiliar with Perler beads, here's a picture. Basically you get these little boards that you put the plastic beads on. After you finish placing the beads, you iron them so the beads melt and your creation can live on forever. 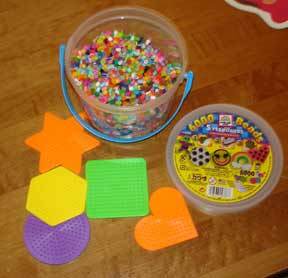 When I was young we had Hama beads, which are pretty much the same thing as far as I can tell. Great craft for the whole family! The Carroll Bag is a medium sized bag, perfect as an everyday handbag or a medium sized project bag. I think it would also make a good spindle bag! The Kureyon version uses 4 skeins and the bag made with Cascade 220 takes 2 skeins. The finished size is approx. 9" X 3" X 11". Trekking XXL 100 sock progress. . .
Crazy busy here. Just enough time to take a quick picture of my progress on the Trekking XXL 100 socks. My three new Japanese craft books are excellent and as soon as I find a few minutes, I will scan some pictures. Gotta run! This weekend was exhausting for us, physically and emotionally, so I have very little energy today. But I did want to share some books I found while surfing around. . . There's a new book called Debbie Bliss Home coming out this fall. It has 26 designs -- everything from bags and scarves to home accessories. Looks like it could be promising. I love just about anything Debbie Bliss does and I have many of her books, so I'm sure this one will make it's way into my library. 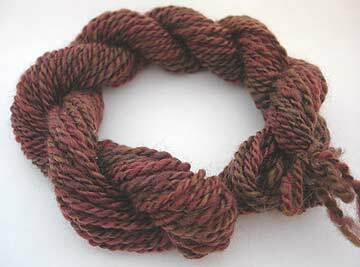 And a new book on dyeing! 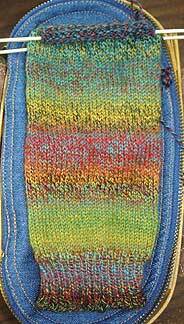 Dyeing to Knit by Elaine Eskesen is also due out this fall. I don't know anything about this book, but I'm always looking for good books on dyeing, so I'm excited when I see new ones come out! The new book from Iris Schreier, called Modular Knits , looks very interesting! 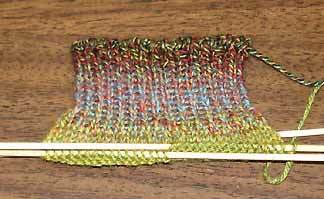 Some of you may already be getting the free tutorials from Iris Schreier that are available free from Art Yarns. Now she has a book due out in September, although Amazon says that it ships in 5-10 days, so I'm confused. The book explains Schreier's modular techniques and includes 25 projects. And if sewing is more your cup of tea -- Nancy Crow has a new book coming out called Nancy Crow : Transitions . This massive (272 pg.) book will have pictures of her quilts, sketches, notes from journals -- all kinds of good stuff! And speaking of books -- my order arrived from Amazon Japan today!!! I'm planning on snuggling into bed tonight with the books after I finish working. I'll give a full report later this week. For now, if you are in need of a Japanese Craft book fix, go check out Crafting Japanese. But lately, my thought have turned to combining crafts and I am thinking once again about embroidery. Wouldn't a mod embroidered design look great on a felted bag? Or how about some decorative stitches here and there on some of these little bags I'm sewing up? When curiosity hits, I turn to my first and greatest love -- books! First up is a new book, just released a few months ago, by Interweave Press called Hip to Stitch by Melinda A. Barta. I was really pleased with this book and the variety of projects. The book starts out with a wonderful section called "Basics" that tells you about the tools you will need. But there are a generous helping of tips sprinkled throughout the section that I found very useful. Then come the projects. There are 20 different items ranging from thimbles to aprons, bibs to knitting needle (!) cases. *All* the materials you will need to complete each project are clearly listed at the beginning of each project. And there are a lot of charts, diagrams and pictures throughout to help you along the way. 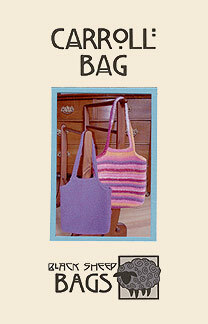 Of particular interest to me were the "Stitch Reference and Needle Storage Book" which is the first project in the book. Also the knitting needle cases, which are shown in various sizes. The smaller size is pictured as a manicure/pedicure set. I can see sewing these up as holiday gifts for my three sisters, mom, mother-in-law, 2 sister-in-laws and one college aged niece. I better get sewing! They are completed with an embroidered monogram -- personalized and girly -- perfect! And now for a book that I think will become one of my favorite reference books, The Embroidery Stitch Bible by Betty Barnden. Wow! There are over 200 stitches in the well laid out book. First of all, it's a spiral bound hard cover book -- perfect for a reference book in my opinion. The hard cover keeps it from getting destroyed, but the spiral keeps it laying flat as you are trying to work through a particular stitch. And the layout is very nice. 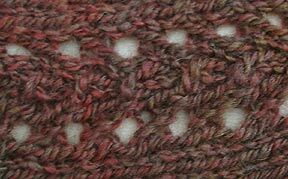 There is a "stitch selector" in the front that displays thumbnails of all the stitches so that you don't have to page through the whole book to find a particular stitch (which is something that drives me crazy about many knitting stitch pattern books.) So, you find the stitch you like, turn to the page indicated and you will find a color photo of the finished stitch, as well as clear diagrams which show you exactly how to make the stitch. And of course, written instructions. There are even little notes at the bottom of each page to tell you alternate names, uses or just little tips about each stitch. I checked this book out from my library, but it is on my wishlist now! And if you are looking for some nice projects to try out your new embroidery skills, there is Decorative Embroidery by Mary Norden. I would call this a beginner book. The designs are simple, yet satisfying. There are 50 projects which include templates -- everything from flowers and leaves to teacups and roosters. While many designs reminded me of something you might see in the 30's or 40's, they are done with a particularly contemporary flair. Know of any other good embroidery books? Let me know! I started these socks on the way to MS&W -- yeah, that long ago. 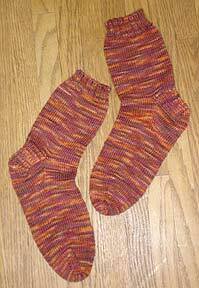 They are made with Cherry Tree Hill Supersock in colorway Indian Summer. 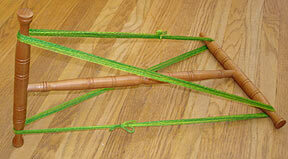 I used US 2's, my own hybrid pattern and they are 60 sts. Finishing these meant I could start these. . .
Yipee! These are Trekking XXL in colorway 100 and they are fun! 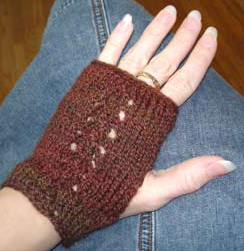 I'm using US 1's, my usual sock pattern and 64 sts. I want to forget all my responsibilities and just sit and knit these all day! 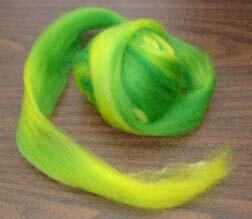 This would not be my spinning fiber of choice simply because it is not all that soft. But man, is it easy to spin! 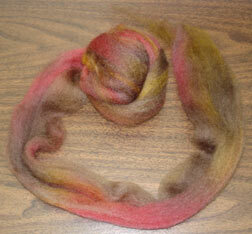 I spun up about 1 oz. 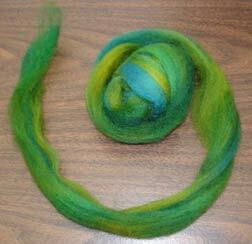 on my Golding spindle and it was a breeze. 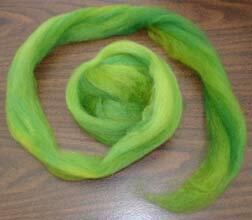 It's a long wool with a nice crimp and the finished yarn has a very nice drape. 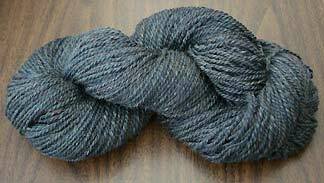 Now this yarn is very soft and lovely, but I found that the Merino is not nearly as easy to spin as other wools I've tried. I did enjoy spinning it though, and I think it was good practice. 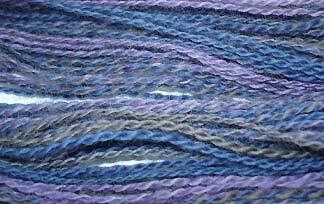 Merino is short staple, smooth and slippery -- extremely different from the Romney! 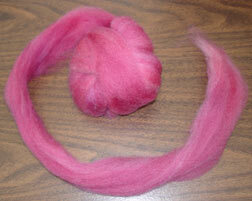 The Joy of Handspinning which has so much info on spinning, has a page which talks about different breeds. In Sheep's Clothing , which gives information on a staggering 100 breeds of sheep! I didn't realize there were so many!